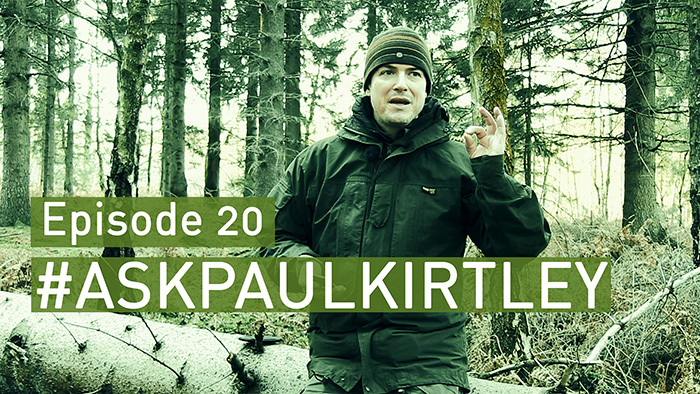 In this episode of #AskPaulKirtley I answer questions about cramp balls as ember extenders, natural soaps, tapping trees for sap (other than birch), have I still got my Woodlore instructor knife, are combinations of wild edibles always safe and waterproof jackets on a budget. Haha Paul. Thank you very much. I will keep the questions coming. Another informative episode (two thumbs up)! I get a weird kick out of cleaning my hands with ash. Seems somehow subversive to use something ‘dirty’ to make me clean. On a side note ash is a great abrasive to clean the glass window on a log burner. I didn’t know chickweed could be used as a soap so that is something I will have to try at some point (if I remember). I always appreciate everyone’s comments here but especially when I learn something too. In this case it was using ash to clean glass… a piece of knowledge which has passed me by until this point. Hi Paul, another great podcast as usual, thank you for sharing you knowledge with us again. In the one answer you were talking about the possible toxicity of willow with other plants. The link here doesn’t pertain to plants so much as to medications people may be taking that could cause reactions. Another great episode – thanks. I have a ridgeline grizzly jacket, not totally waterproof but pretty good, it is a really nice jacket for most of the time and less than £100. Just to add to the debate! Nice to see you push your courses, just a point to help (not moan or complain). I sent an email enquiry a few weeks ago for some information about a course and have had no reply, maybe there is a snag with the system. Sorry to use this to say this but email might not work? I could be wrong but I think snowsled have stopped producing clothing, beat port of call would be Snugpak a great English company as well. Given that Sycamore may be regarded as an “invasive” species in some parts in the UK, it would be useful to hear about any bushcraft uses for this tree – including tapping, if anyone has tried it. Sycamore is a very useful species, particularly given its success in becoming common and widespread in many areas over the past several centuries. Sycamore wood is non-toxic, odourless and carves nicely, resulting in light yet durable utensils such as spoons, spatulas, ladles, etc. It is also a good source of dead, dry standing wood for friction firelighting. In fact it was the first species with which I had bow-drill success, many years ago. in response to the question regarding willow bark allergy; surprisingly, there is quite a body of information on the interweb on the issue, some of which surprised me (and I am a former pharmaceutical chemist at the main producer of Aspirin!). One interesting point is that taking willow bark at the same time as Aspirin will increase the dosage of the Aspirin, which can have side-effects, especially if you have a heart condition. One shouldn’t forget that salicylic acid, the active ingredient in the bark, is a pharmaceutical substance, however low the dose. I have added just a couple of the links available below. Loved the episode as usual and also enjoyed the links of Kevin. I just searched the medical journals. The one below seems interesting. Phytother Res. 2011 Jul;25(7):1102-4. doi: 10.1002/ptr.3386. Vlachojannis J, Magora F, Chrubasik S.
Many believe that willow is the natural source of aspirin. However, willow species contain only a low quantity of the prodrug salicin which is metabolized during absorption into various salicylate derivatives. If calculated as salicylic acid, the daily salicin dose is insufficient to produce analgesia. Salicylic acid concentrations following an analgesic dose of aspirin are an order of magnitude higher. Flavonoids and polyphenols contribute to the potent willow bark analgesic and anti-inflammatory effect. The multi-component active principle of willow bark provides a broader mechanism of action than aspirin and is devoid of serious adverse events. In contrast to synthetic aspirin, willow bark does not damage the gastrointestinal mucosa. An extract dose with 240 mg salicin had no major impact on blood clotting. In patients with known aspirin allergy willow bark products are contraindicated. Hi Paul and thanks for another episode. I’ve never got round to trying chickweed as a soap and it’s a plant that I think is wonderful to eat. I take it that the saponin content is so small as to not cause a problem consuming it? I enjoyed listening to this episode very much, but the bushcraft type jackets you talk about are expensive. When I desperately wanted a ventile one a few years back I couldn’t afford, so I bought some ventile online and used a sweatshirt pattern to knock one up. It wasn’t that difficult and I was able to customise it a bit. Why not suggest this as an option to your listeners – it really wasn’t that hard. 1. In an emergency, how does one obtain water in such conditions? 2. What kit would you recommend taking?